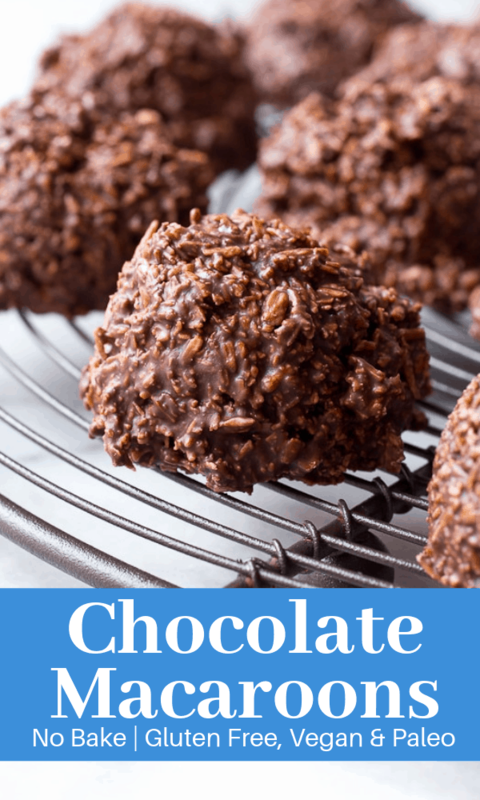 No-Bake Chocolate Macaroons take a few minutes and a few stirs to transform a handful of pantry ingredients into a decadent chewy chocolate cookie! Hallelujah, praise your deity of choice, we have chocolate! 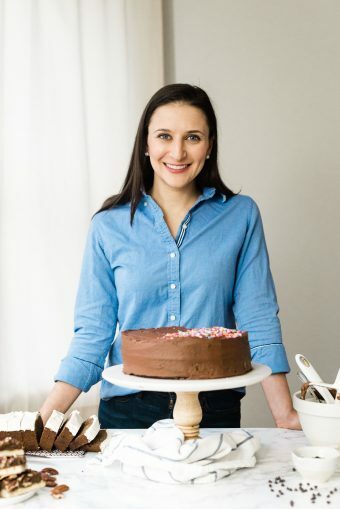 It has been an alarmingly long time since we’ve shared a chocolate recipe together. I’m so glad we’re fixing this, aren’t you? And just in time for Passover. What does chocolate have to do with Passover, you ask? 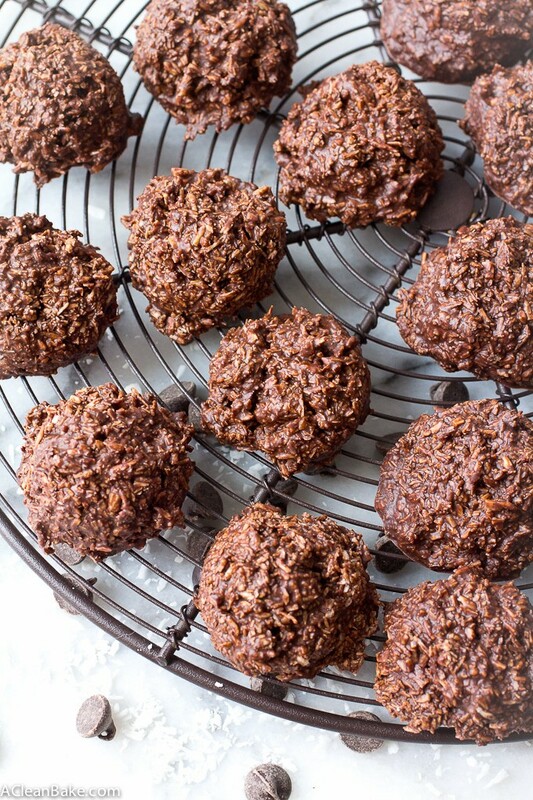 Nothing at all, but chocolate macaroons do. 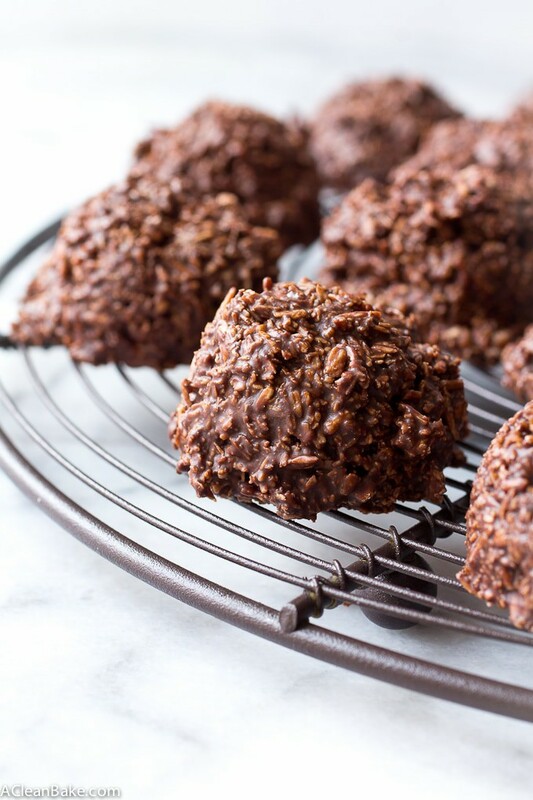 To clarify, these are macaroons – unleavened coconut cluster cookies – not macarons – finicky, delicate French egg white pastries sandwiched together with a sweet filling. There is a very distinct difference, and if you’re attending a sedar this week/end, it’s an important one. 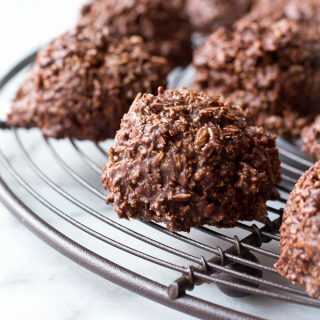 Macaroons are a legal and, let’s face it, beloved addition to the Passover table, and this version sets itself apart even further because neither eggs nor baking nor a long list of ingredients are required. In fact, all you need is chocolate, coconut oil, unsweetened shredded coconut (unsweetened can be harder to find; this is the brand I use), vanilla extract, and a pinch of salt, which barely even counts. 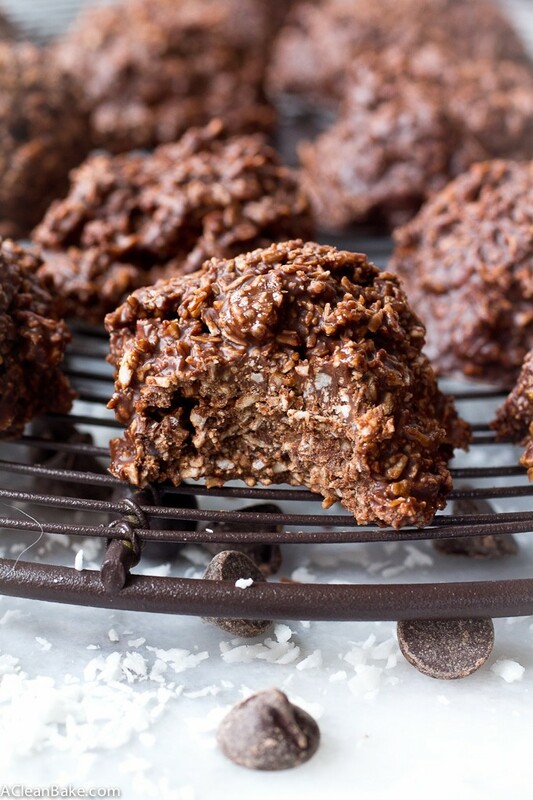 If you’re a person who is intimidated by baking, or you simply need to make something fast, this slightly non-traditional cookie would be ideal for you to make for your sedar. I don’t want to overstate the Passover connection, though. I first made these cookies because I was just not in the mood to turn on the oven, and needed a little something sweet, and quick. They take about 5 minutes to throw together (not counting the chill time in the fridge – tease, I know) and all but demand that you lick melted chocolate off of the spoon and your fingers. What’s not to love? Line a cookie sheet with wax paper, parchment paper or a nonstick pad and set aside. In a large, microwave-safe bowl, or using a double boiler, melt together the chocolate and coconut oil. Stir until smooth and well-combined. Fold in the coconut until well combined. Scoop 2-3 Tablespoon portions on to the prepared baking pan and transfer to the refrigerator to cool and solidify, about 1-2 hours. These macaroons look awesome! Love that they can be made vegan and that you used coconut oil 🙂 Pinning! I love no-bake options! Of course licking the chocolate off the spoon is required too! Absolutely perfect!!! These look so delicious. They look amazing! Is it possible to use Cocoa instead? Instead of the melted chocolate? No, I’m sorry, cocoa powder will not work! So wonderful to hear! Thank you Lysa! Amazing! I can’t wait to try these. I think I’ll add some chopped peanuts to them for some extra crunch! Great recipe. Thank you! Ooh that would be delicious! Let me know how it goes!